Ductless Mini Split Air Conditioners - LG, Daikin, Etc. Ductless mini split air conditioners are versatile air conditioning systems that can be used for a variety of purposes, from single zone mini split systems to multi zone systems that are ideal for use in multi-family homes or housing add-ons. Their compact size makes them easy to install and perfect for specific rooms or areas that need to stay cool. We carry high-quality ductless air conditioners from some of the best names around. Our inventory includes LG, Panasonic, and Daikin mini splits just to name a few. Don't hesitate to reach out to us should you have any questions – we're here to help you find the right mini split air conditioner for your needs. 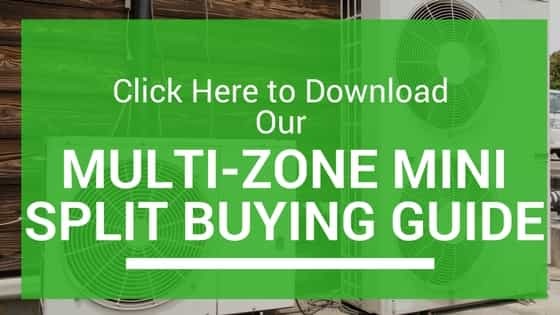 Our Multi-Zone Mini Split Buying guide was designed to make the selection process quick and easy. Learn about all the types of units that are available, how to size your spaces, and why mini splits are the right choice for you.